What is Treasure Trove? And What If You Find Buried Treasure? Have you ever dreamed of finding buried treasure? Maybe you should be careful what you wish for. If you use a metal detector in the UK and you get lucky, you need to know about the rules of treasure trove before you start spending your windfall. If you dig up something golden, glittering and magical anywhere in the United Kingdom, very specific rules of "Treasure" or, in Scotland "Treasure Trove", apply to what you may be entitled to and what you have to do. And if you think that the chances of your ever having to worry about this are pretty remote (and they probably are) you might also consider that what could be at stake can be pretty impressive. 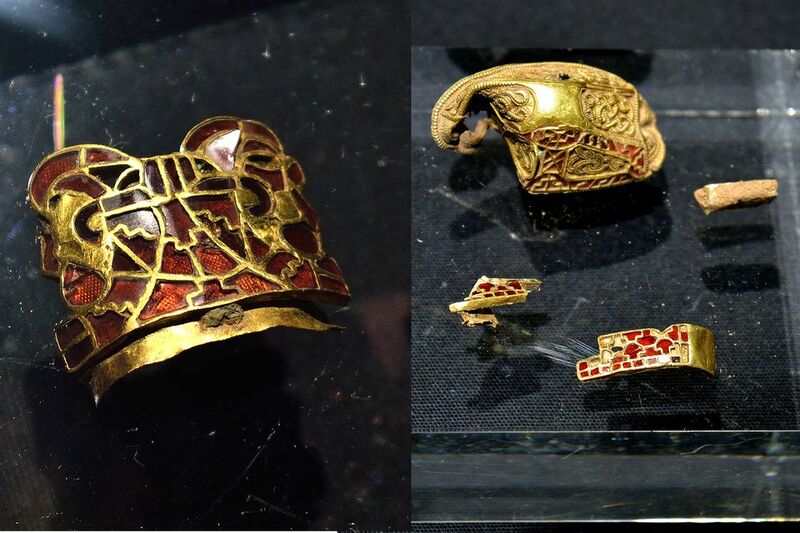 Just a few years ago, every metal detector fan in the UK - and possibly the world - could not help but envy Terry Herbert who dug up the Staffordshire Hoard. This hidden treasure find, unveiled to the world in September 2009, was the biggest hoard of Anglo Saxon gold ever found in the UK. After 18 years of treasure hunting with his metal detector, Herbert uncovered a hoard that contained more than 3,900 individual pieces of seventh century, Anglo Saxon gold and silver. The gold, valued at £3.3 million, was acquired by The Birmingham Museum and Art Gallery and The Potteries Museum and Art Gallery in Stoke-on-Trent. The finder, Herbert and the landowner, farmer Fred Johnson, shared the proceeds from the sale of the hoard (about $4.73 million). But that was not the end of it. In 2012, 81 additional items found at the site by archaeologists were declared treasure, Since they are part of the same hoard as the 2009 discoveries, Herbert and Johnson share the value of those too. Not exactly. Technically, all hidden treasure found in the UK belongs to the Crown (the Queen in her state role as monarch but not as her private property). The rights and legal obligations of the finders and landowners are covered by the Treasure Act of 1996. The law is different in Scotland, which still uses the older treasure trove common law rules. Is it Treasure or Treasure Trove? made of at least 10 per cent of a precious metal – gold or silver - if not prehistoric. coins that are least 10 per cent gold or silver. If a coin hoard as a whole does not contain that proportion of precious metal, then at least 10 individual coins must. Before the 1996 act, finders and valuers had to prove the objects were buried and that they were deliberately hidden with the intention of digging them up at a later date. That proof isn't required anymore. In Scotland, the Common Law of Treasure Trove is still the law of the land. Any buried hoard or item of archaeological interest, regardless of whether it is made of precious metal, is treasure trove and belongs to the Crown. The law applies to objects found by chance rather than during an archaeological dig. Throughout the United Kingdom the process is similar, although different authorities and valuing bodies are involved in Scotland. If you find objects that you believe to be treasure, you must report your find the appropriate authority. In England, Wales and Northern Ireland, finds must be reported to the Coroner within 14 days - and failure to do so can get you a £5,000 fine and three months in jail. The coroner holds an inquest to determine if the object is, in fact, treasure. If it is not treasure, it will be returned to the finder, who may keep it - after settling any claims made by the owner of the land on which it was found and any tenant of the land. If it is treasure, it will be offered to appropriate museums. If no museum chooses to bid on it, the Crown may relinquish its claim and, once again, it is returned to the finder. And If It Is Treasure? Once the coroner determines that an item is treasure, a valuation committee, made up of experts in the appropriate fields, determines a market value. In England, valuation takes place at the British Museum and in Wales at the National Museum of Wales. The Department of the Environment for Northern Ireland performs that duty in Northern Ireland, and in Scotland it is the National Museums of Scotland. Museums can then bid on the objects and what they pay is generally awarded as a reward to be shared by the finder, the landowner and the tenant or occupier of the land. The finder of treasure has no legal right to any payment at all. In Scotland, this is made very clear in the policy on Treasure Trove: "Finders have no ownership rights to any find they make in Scotland and all finds, with the exception of Victorian and 20th century coins, must be reported to the Treasure Trove Unit for assessment." Similar wording is used to describe finders rights and entitlements in England, Wales and Northern Ireland. But in practice, the finder and the landowner are almost always awarded the full market value of the object, paid by the museum that acquires the treasure, to share, 50-50. Which is how Mr. Herbert, finder of the Staffordshire Hoard of Anglo Saxon gold, and the farmer, Mr. Johnson, ended up sharing more than $4 million. If you are a metal detectorist, the odds are apparently a lot better than winning the lottery. Dr. Michael Lewis, head of portable antiquities and treasure at the Portable Antiquities Scheme, told the BBC that of the 80,000 finds reported annually, about 1,000 of them turn out to be treasure. And some places are more treasure rich than others. In 2018, authorities reported that the average value of a treasure find in the UK in 2017 was £2,671 and that the number and value of treasures found was on the increase. The Bedale Hoard - A hoard of silver and iron Viking jewelry and ingots, and a gold inlaid silver sword pommel, found in a North Yorkshire field in 2012 and acquired by the York Museums Trust for £50,000 following a public fundraising campaign. The Lenborough Hoard - A collection of 5,251 Anglo Saxon and Norman silver coins, about 1,000 years old, found in a Buckinghamshire field in 2014. The coins, found wrapped in a sheet were the largest Anglo Saxon coin hoard ever found. The coins came from 40 different English mints and carry the heads of King Ethelred the Unready and King Canute. In 2016, they were valued at £1.35 million. The Wick Hoard - A hoard of 91, 2000 year old Roman coins, from the time of Mark Antony, found in Wales in November 2015. The Watlington Hoard - A Viking and Anglo-Saxon treasure from the time of Alfred the Great, found in Oxfordshire in 2015 and acquired by the Ashmolean Museum in 2017.